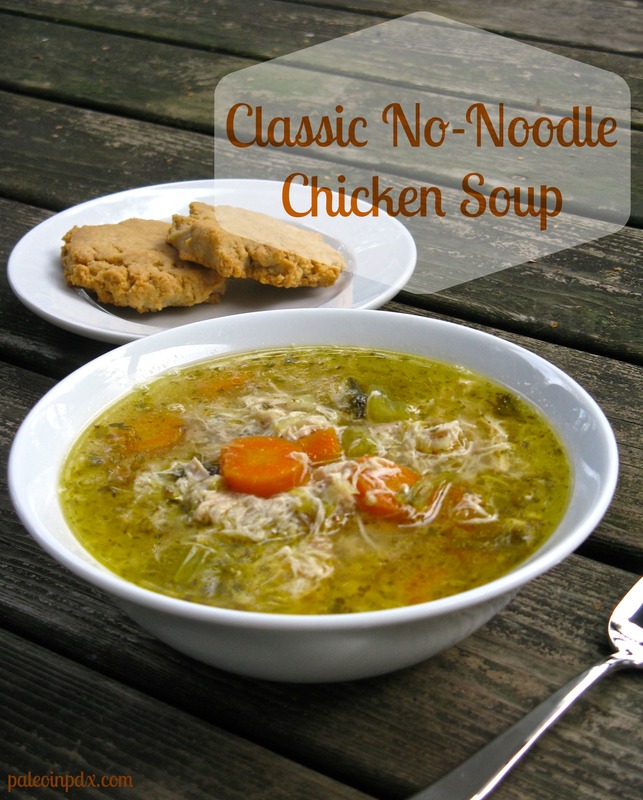 As I mentioned recently on Facebook, I’ve been eating a lot of homemade no-noodle chicken soup. I can’t seem to get enough of it and not only that, my body loves it. I think it’s by far my ultimate comfort food, especially on a cold fall or winter day (really, I’ll eat it pretty much anytime though). I’m also trying to give my immune system an extra boost right now since I am flying to Hawaii this Saturday. I especially don’t want to be sick in Hawaii because I’m going there for a seminar with Kelly Starrett and also because I want to enjoy myself! Anyway, in all of my chicken soup eating lately, I realized that I didn’t have my classic go-to chicken soup recipe on my blog. 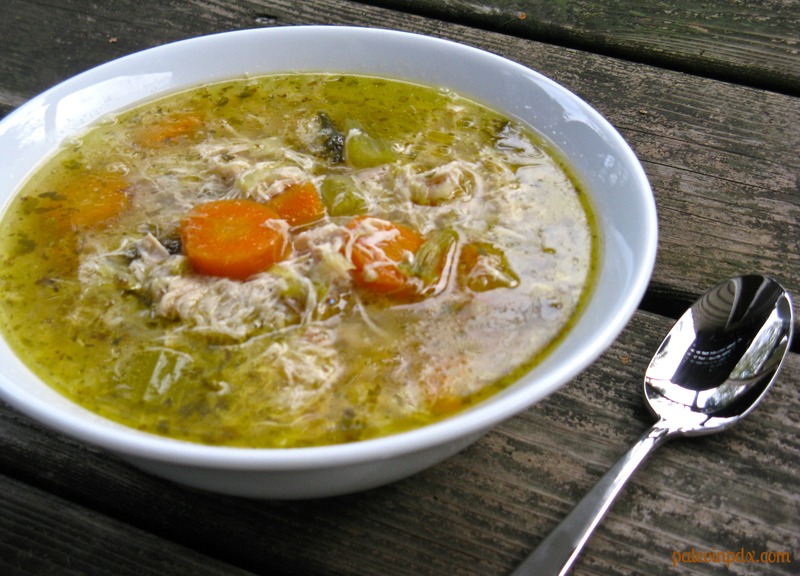 I have a few other chicken soup variations posted from last fall, but not my standard recipe. Therefore, I decided it was necessary to share it with all of you. The recipe is easy, but does take some time to prepare the chicken and broth, so make sure to plan ahead. Place chicken in a deep pot and cover with water (add the giblets to the pot as well, if desired). Make sure it’s enough to completely cover the chicken, but a few inches below the rim of the pot. Add the 2 Tbsp of sea salt and place on the stove over medium-high heat. Bring to a simmer and then, reduce heat to medium-low and cover with a lid (tilt the lid to allow a little air to get through). Simmer for 2-4 hours (the longer, the better). Once the chicken is done simmering, carefully remove from the pot and place on a large dish or cutting board to cool. Strain broth into a large bowl or pot and set aside. Meanwhile, in the same pot the chicken cooked in, melt the butter over medium heat. Add the onion, leek and garlic, and stir. After a minute or so, add the celery and carrots. Continue to cook for a few minutes. Then, pour the strained broth back into the pot. Add the bay leaves, oregano, parsley, cayenne or red pepper flakes and black pepper. Stir and bring to a simmer over medium-low. Once chicken has cooled, remove meat from the bones and add to the simmering soup; stir. Save bones for making bone broth later (can freeze too). Save the skin and giblets for broth as well, if desired or compost. Add the extra bone broth if needed and allow soup to simmer another 15-30 minutes. Remove bay leaves and serve. *This soup is pictured with my almond flour biscuits. The biscuits are a delicious complement to the soup, and I especially love smearing them with butter and dunking them into the hot broth. I’ve been eating chicken soup and beef stew by the bowlful lately. There’s something so right and good about it this time of year. Thanks, Mary Catherine! I agree, it does taste extra good this time of year…beef stew too. Fall meals at its best! Oh, that looks extraordinary! I love comfort food in autumn. Pinned this to make this winter!!! Yum! mmmmmm……..sounds delicious! My brother gave me a chicken from his granddaughter’s 4-H stock, this will make good soup! I never heard the term carrots cut into ‘coins’ before! Have a wonderful time in Hawaii! Really, my mom always referred to sliced carrots (in circles) as coins? Funny! That looks amazingly rich and delicious. It’s truly chicken soup for the soul! Amazing recipe, simple and clear, thanks a lot! One question: will you also post a recipe on how to make the bone broth from the left over chicken bones? I am new to this, as I have only very recently been able to get my hands on some quality organic grass-fed chicken (very happy about that!) so any help is greatly appreciated!